Racing continues on Friday 1st Jan, AND Saturday 2nd Jan. More details including Race Start Times can be found here. Twickenham CC was out in force for round one of the Rollapaluza winter series. I was the sole male rider for TCC and V, Dorchie and Eleanor were our representatives in the women's race. Supported by Denise, George, Claire and a host of other friends and family. 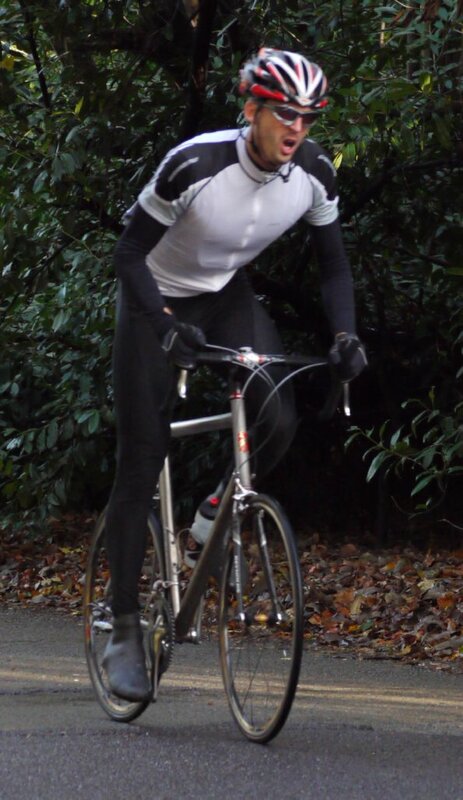 I had thought long and hard about my racing attire and considered it best to dress more like a London messenger in jeans and t-shirt rather than in full racing kit. This decision in the main was right but, looking at my fellow competitors, there were a few discrete lycra garments and as the evening progressed, more and more full racing kit became apparent. My involvement in the men's race was brief. In my first qualifying attempt I posted as time of 23.33, which I thought was reasonable. On checking, however, with the race commissair, 5 minutes before the close of qualifying, the slowest time in the top 16 was 22.61 and, therefore, I would have to go again and get somewhere near my personal best time of 22.34. As I was unable to improve on my time, with only a 23.80 in my second run, I would not go through to the knockout phase. The racing thereafter was fast and furious with some amazing times being posted. 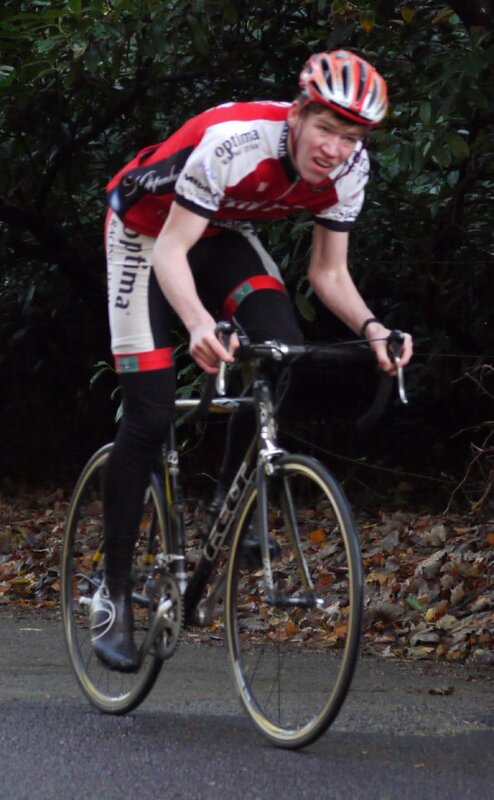 The eventual winner, Casper from Rollapaluza, produced the fastest ever time of 21.05. The women's race was much more exciting. V and Eleanor shaped up against each other in qualifying. There was history here with V seeking to take the honours after being defeated by Eleanor at the TCC awards. V prevailed on this occasion qualifying for the knockout rounds in 4th and Eleanor in 7th. Dorchie cruised through qualifiying in 3rd place. Eleanor was up first in the knockout round in a tough draw against the 2nd faster qualifier. The riders were evenly matched throughout the contest but on this occasion Eleanor's strong finish was not enough to take her into the semi-finals being pipped by just 0.5 secs. Dorchie breezed throught the quarter-final round, beating her opponent by 2 secs. V's race in contrast was filled with drama and dispair. She was pitched against Anna, a seasoned Rollapulza racer and who was a familiar face as she had assisted at the proceedings at the TCC awards event. On paper V was the superior athlete and this proved the case in the first 250 metres when suddenly V's right foot sprung from it's strapping ending her race. Anna pushed on to complete the distance. The race official elected to re-run the race over 250 metres, a decision that was not popular with either rider. V finally prevailed an moved to the semi-finals. Dorchie was up next against Estelle Rogers who had defeated Eleanor in the previous round. Surrounded by the entire TCC crew, Dorchie prepared for a tough race. Estelle got the better start and held a marginal lead throughout the bout. We screamed the distance to Dorchie as it counted down and she kicked hard with 100 metres to go and snuck the win by 0.7 secs for a place in the final. With barely time to catch our breath, V was up against the favourite lady Niamh who had qualified with a time of 24.84. V knew what she was up against and focused on the task ahead. This race was incredibly close and it was impossible to separate the riders. The race ended and we looked up at the times to see that V had taken the win by 0.27 secs to set up an all TCC final. The toughest decision of the night was who to cheer for in the final. It essentially came down to where you were standing. I found myself in Dorchie's camp with Eleanor. V had a similar gathering of supporters around her. V started extremely well and again Dorchie found herself marginally behind throughout the race. In an amazing display of strength and sheer determination, Dorchie kicked again and within 100 metres managed to overhaul V's lead and take the victory by 0.45 secs. See Rollapaluza.com for the official results, photos and more. Round 2 is on Tuesday 12th January in Blackfriars - details to follow. Congratulations to all who represented TCC so admirably and especially to Dorchie and V.